In 2016 we commemorated out 20th year in business by launching our Giving Back program. Our whole team designed and participated in this program, and they became so passionate about Giving Back that it is now a permanent part of what we do. We’re providing 25 children from across Ontario who are undergoing treatment for cancer, and 25 parents, with field-level tickets to Blue Jays games. We’re also providing them with gift certificates so the kids can come home with a great souvenir of their day at the ball park. We’re doing this through an organization called POGO*, the Pediatric Oncology Group of Ontario. POGO champions childhood cancer care through collaborations in healthcare innovation, survivor care, family assistance, population data, policy development, research and education. 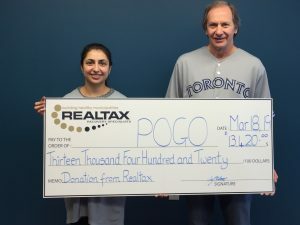 Jeff Oberman from Realtax presents Tanya Mavalvala from POGO with our contribution for 2019. 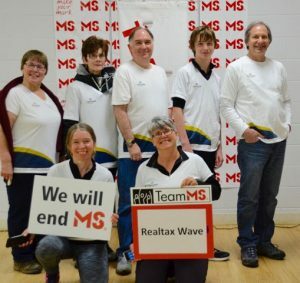 For the second straight year, members of the Realtax team raised thousands of dollars for the MS Society. We provide support to a local shelter for women and children who are escaping abusive relationships. In 2014 we established the annual Realtax Originality Scholarship at Seneca College. It is awarded to a graduating student in the Public Administration Program who has demonstrated innovative, outside-the-box thinking and has shown creative solutions in their approach to the program curriculum. We did this because we believe that it’s vitally important to nurture, recognize and reward creative thinking and innovative solutions. We know that progress begins with great ideas. In 2015 we established a second Realtax Originality Scholarship at Seneca College; this one is awarded to a graduating student in the Real Property Administration Program. In 2017 we established a third Realtax Originality Scholarship. This one is awarded to a graduating student in the Law Clerk Program. Inn from the Cold provides homeless people with services that are designed to assist with finding housing, employment, mental health support and other necessities such as hot meals, warm clothing, laundry, internet and bathing facilities. Each December we provide families in need with holiday meals and gifts. 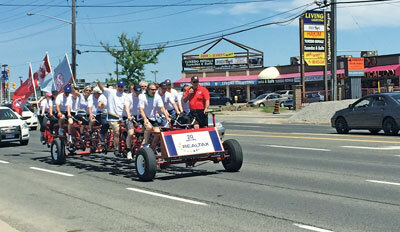 Every year our team goes for a ride…on a bicycle built for 30! In the process, we raise thousands of dollars for the Heart and Stroke Foundation. We’ll be doing the Big Bike ride again in 2018. Jeff is a founding member of this unique book club. It’s unique because every member of the club, aside from Jeff, is visually impaired. Founded in 2011, the VIP Book Club enables it’s members to share in the enjoyment of great books, stimulating discussions, camaraderie, and our end-of-the-year and start-of-the-summer lunches. The club meets once a month at the Richmond Hill Public Library. If you would like more information about the VIP Book Club, or if you may be interested in starting a similar club in your community, please email Jeff at JeffOberman(at)Realtax.ca.